My insight into the world of global economics and the state of the stock market is pretty slim but I think it’s safe for me to assume that times are getting a little tough in the business world. It’s time to tighten the purse strings because cut-backs are inevitable. Sadly enough for us in the graphics industry one of the first things that suffers is the allocation of marketing and advertising dollars. Right now is a good time for most companies to reflect on spending habits and concentrate on being more targeted in their marketing efforts and staying on (a tight) budget. So yes, whilst it’s a good idea to re-assess your spending, NEVER do away with promoting your services or products to your customers even when times are tough. It’s been widely reported that when a business steps up their marketing efforts during a recession, sales and profits will increase! 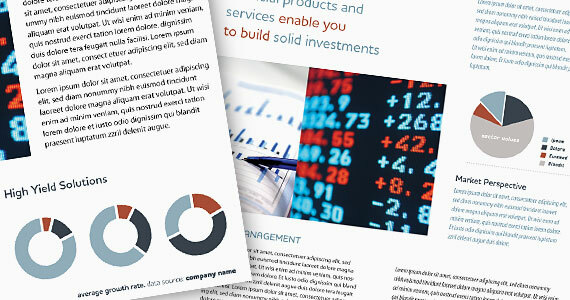 So for the small business owner out there producing his own print marketing materials, take advantage of keeping ahead of the competition whilst cutting back on excess spending and maintain visibility by using affordable solutions like StockLayouts graphic design templates instead of using a design firm that may scoff at your miniscule budget. Now that may have come across as a slightly offensive statement to you if you’re a graphic designer who’s out there competing for work, but stop and think of the benefits from your point of view where you can produce agency-quality designs with this very same resource almost immediately for those bread and butter clients that demand your time and effort but complain when it comes to the cost. Your time is better spent working on the projects that require your creative attention and you can make excellent mark-up when it comes to billing. On reflection, maybe this recession may not be so bad after all.